James R. Sloto was admitted to the Florida Bar in 1976. He graduated from the University of Illinois in 1973 with a B.S. degree in Finance, and with a J.D. degree from the University Of Miami School Of Law in 1976. He is a member of Miami-Dade County Bar Association, the Real Property, Probate and Trust Law Section of the Florida Bar, and the Real Property, Trust and Estate Law Section of the American Bar Association. His practice is concentrated in the area of probate, trust, and guardianship administration and litigation and all aspects of real estate law and transactions. 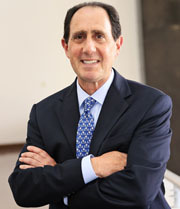 Mr. Sloto’s community involvement includes his membership on the Probate and Guardianship Committee of Miami-Dade County Bar Association, his membership in the President’s Cabinet of Miami Children’s Hospital and Foundation, his tenure as an adjunct professor at Miami Dade College (formerly Miami-Dade Community College), and as a frequent author and lecturer for the Florida Bar, numerous civic organizations, and state and national legal education organizations. In addition, Mr. Sloto has lectured to the National College of Probate Judges.